From covering up unsightly wires to creating esthetically pleasing accent pieces around your home, twine is the perfect natural fibre material for your conscious lifestyle home. The DUFMOD style is ‘raw beauty with an expression of wildness and freedom‘. An open, tranquil space full of natural materials and your unique, statement pieces. Twine is budget friendly, versatile, and creates beautiful textures due to the nature of the natural material. So using twine, a strong, twisted thread composed of natural fibres such as cotton, sisal, jute, hemp, henequen, and coir, just makes sense. Here are 5 ways we love to see twine being used to give your space a facelift and add natural textures to the interior of your home. Remember a glue gun and your imagination are your best friends for these projects. The lovely folks over at The Brickhouse have taken some manila rope and a little time and created this stunning rope wall. Divide a large room or working space while allowing light and air to pass through. You can turn one large interior area to be used for many many purposes and still be open, accessible and of course look awesome. Visit their site to see how they built it here. A neutral color pallete for furnitiure is a great base for you to have fun adding, bold colored accessories to them like art work, cushions, plant pots, etc. If you want them stand out on its own without the fluff, textures are always a great option. Anderson + Grant turned a old vintage stool into a beautiful rustic accent piece in their home with jute rope, glue gun and a staple gun with a little imagination. 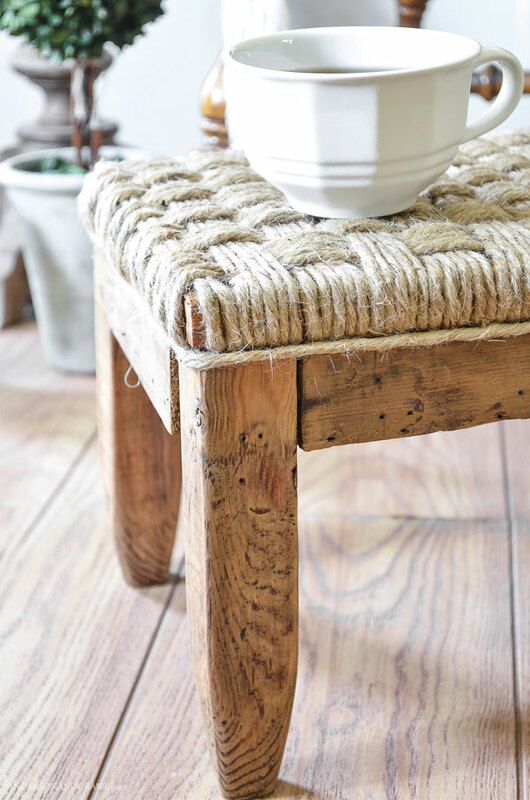 See how they weaved this jute rope rustic stool. Exotic locations like Morroco, Bali, Hawaii, Thailand, just to name a few exudes a free-spirited vibe that is addictive and esthetically refreshing. Create that atomosphere without breaking the bank by repurposing an old lamp shade, lantern or basket for the lights in your space. 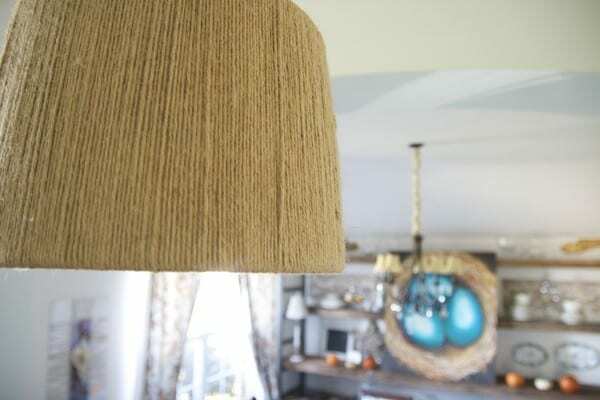 Ashley from @ THE HANDMADE HOME decided to do a quick spruceup with their entry way light with this rope light tutorial. If you are just not willing to spend hundreds of dollars on a jute rug and they all seem to look the same to you, this project can be very satisfying for you and your floors. You can create a rug whose size and shape is to your own liking made with the natural fiber and textures you love. You can purchase a tarp or sheets of canvas fabric. They make a great base for glueing and weaving the twine and easy for cleaning maintanence. Use the tutorial on how to make rope placemats and adjust it for a larger surface. Remember to do both sides of the tarp and canvas. Make as many of tablemats in various sizes. Assemble all the pieces on the surface you wish to cover before attaching them all together to form your creative designed jute rug via glue gun. We hope these ideas provides some interior inspiration for your earth inspired home.